Lamplighters turned night into day. A staple of the urban Victorian streetscape, the nostalgic image persists of a lone man, walking a darkening city street as dusk descended behind him, extending his staff to ignite each dark, cold lamp stem to life with a small flame. He would light the way along the lonely city lanes, so that those who were out after dark would not lose their way. 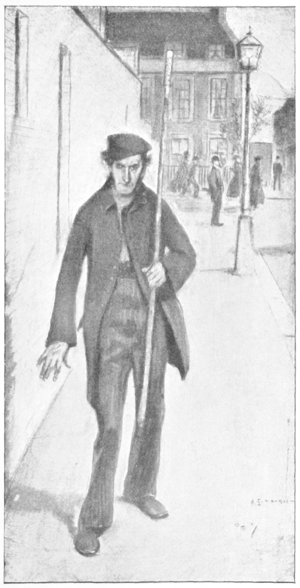 A lamplighter stood on his street corner, leaning on a long brass-tipped staff. There, he would watch the time. As dusk approached, he hefted the end of his staff to light the street lamp overhead. He would then walk quickly from one side of the street to the other, lighting the street lamps as he went. When all the lamps were lit, the lamplighter was done for the night, until daybreak approached, when he walked the streets once again, to extinguish the flames. Lamplighting wasn’t known to be a particularly grueling job, but most lamplighters were assigned routes of 70 to 80 lamps each. They were paid about $2 a day. Unlit gas jets within the lamps were known to immediately draw taxpayer complaints to the department’s superintendent. The amount of work required to do the job varied by season. The number of lamps rarely changed, but the work required to complete the route and light them did. After the lamplighters extinguished their street lamps, they ate breakfast and then starting cleaning. Cleaning was the most work. In practice, in Lowell – a city of about 78,000 residents in 1890, the whole lamplighting system worked a little differently. Up through the 1880’s, Lowell’s Department of Street Lamps employed a foreman, five other men, and 28 boys. All under the direction of the city’s fire department chief, Edward S. Hosmer, the boys were charged with lighting almost all of the city’s 876 gas-powered lights. Only 35 gas-powered streetlights in the city’s outskirts were lit by one of the five men employed by the Department of Street Lights. 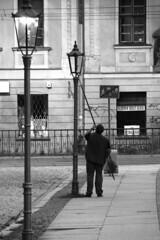 When these men weren’t going out to parts less travelled to light these street lamps, they cleaned the lamps, and set, fitted, and sometimes reset posts, as needed. By 1888, 876 gas lights still dotted Lowell city streets. They were beginning to be replaced by electric lights, but the city was still adding more gas lights than it was turning off. The city also had 397 gasoline and kerosene-powered lights, and was gradually replacing these with gas-powered lights as gas mains were laid in the streets. Through the 1880’s, the Lowell Police Department was charged with putting the lamps out as the wee hours of the morning approached. In 1887, the police complained that this rather cumbersome duty not only distracted them from other more important duties, but also provided criminals with a way to predict when and where the patrolmen would be busy. The police were required to extinguish 850 lights each night, 750 at 1 AM, and another 100 at 3 AM. Most of these lights were outside of the city’s main downtown area, where electric lights had begun to be substituted. Sometimes, it took as much as three hours a night for a policeman to extinguish his lamps on a given night. The remaining lamps on the outskirts were extinguished by the Street Lamp Department’s regular men. The Lowell Police got their wish granted in 1890, when the Department of Street Lamps no longer hired boys to light the street lamps or required policemen to extinguish them. On July 1, 1890, five men were hired into the Street Lamp Department, bringing its total headcount to 11 men. The city was divided into 10 districts, each having 90 to 106 lamps. Each of the ten districts was assigned to one of the men; the last man acted as the group’s foreman. Immediately, the new system gained favor as it was found to lead to better cleaned lamps and also decreased the number of frozen or broken lanterns, which were more quickly reported. The job of the lamplighter was not an altogether solitary one. The warm months brought company to the lamplighters as they made their rounds. “Bug cranks”, or “naturalists” as they were more politely known, followed after the lamplighters to collect moths, millers, and beetles that had been attracted to the flames and had lost their lives. Lamplighters could earn an extra quarter, or even a half-dollar, if they brought especially rare specimens to these bug collectors. Lamplighters recalled that the oddest folks were met in the mornings. One lamplighter recalled meeting an old man each morning, rain or shine, who followed the horse railway track, with his eyes never leaving the ground. Each morning, he searched the ground for valuables that had been lost from passengers’ pockets as they caught, got off, or rode the horse railway. He was known to find coins, jewelry, opera glasses. With the coming of electricity, lamplighters began to disappear from the Victorian city streetscape. As electricity came to the cities, the task of lighting the roads depended more on some invisible someone flicking a switch at the electric company, rather than a team of men individually lighting each street lamp. In the years leading up to the twentieth century, electric lights continued to replace their gas- and gasoline-powered counterparts. In 1888 alone, 33 electric lights were added to the 119 that had been in place in Lowell when the year began, not including the eight electric lights on Fort Hill Park by 1888, which ran during the summer months. The number of gas street lamps continued to decline as Lowell progressed into the twentieth century. By 1909, Lowell had outsourced the care of its remaining gas lights to an outside provider. This post brings to mind a song entitled “The old Lamplighter”. I am curious as to how the old lamplighters who had to light the lanterns with long poles managed to do so during severe storms. Were they able to light them, and if so, how? Or were they excused from their duties on those nights?